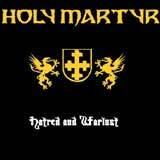 Hatred and Warlust is a six track, self produced demo that comes to us from an underground Italian band, Holy Martyr. Their style is very much in the classic 80's heavy metal vein. The band derives their sound from a variety of influences: Bay area thrash, the epic metal qualities of Manila Road, and classic metal acts such as Iron Maiden and Judas Priest. In addition to the aforementioned bands, Holy Martyr also lists a favorite underground band of mine, Attack as an influence as well. I admire how the band has been able to pull elements from each of these bands into a style their own. You can hear the genuine energy an enthusiasm the guys have for metal in each of the songs. The songs feature strong dual guitar leads and extended solos that will certainly please all you big guitar fans out there. Of the 6 tracks on this CD, one is 6+ minutes, one is 8+ minutes, and another is 9+ minutes. The strong guitar work keeps these epics interesting from start to finish. The drum work is very energetic, ranging from a speed metal, double bass fueled attack to a thrashy style that has Kill 'Em All written all over it. The vocalist is a certainly good fit for the band: He is able to sustain the high, soaring notes as well as give some aggressiveness to the thrashy, staccato vocal style as well. While each of these songs is very enjoyable, especially with the vast array of old school elements used in their sound, none of the songs is a "knock out punch." As the band develops their songwriting skills, I think they will be able to come up with the melody, dual solo, or epic moment that just blows you away like Maiden, Priest and Attack are able to do. This band has been around since 1994, but this particular lineup has been together only since 2001. As they work together more and grow accustomed to each other, I'm sure the collective songwriting skills of the band will improve. As you would expect, the production is very raw considering it is a self financed demo. For any fan of underground 80's style metal, I recommend checking this band out. The promo package from this band indicates that they are not looking for a label or promoter. However, Denis Gulbey at Sentinel Steel and J.B. Mestead of Molten Metal have been friendly to classic, underground bands such as this. They routinely bring long forgotten classic metal albums of the 80's and current underground artists to life. I'd love to Holy Martyr to possibly get in touch with someone like Sentinel Steel or Molten metal as their music deserves to be heard.